Union County College commissioned The Musial Group to reinvent their 1960’s Brutalist building to be the face of a new pedagogical approach for the college. The Musial Group, through a surgical approach to demolition, chose to express the robustness and unique structural systems that had been obscured through decades of ad-hoc renovations. Lessner commons sought to provide an openness afforded by contemporary technologies. Highlighted aspects of the existing building were associated with different programs, creating indeterminate, though highly considered circulation. With an open plan organization, the space was characterized primarily by the articulation of the ceiling with respect to the existing structure and built in furniture. 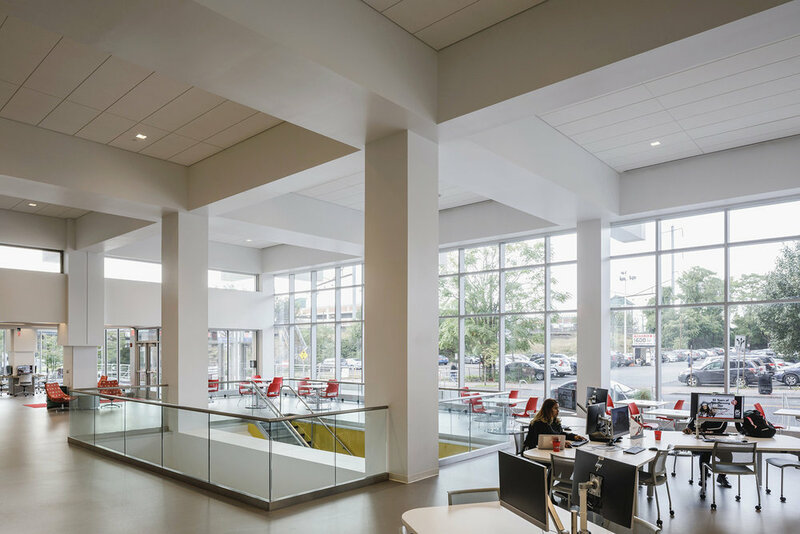 Variations in ceiling height and lighting strategies provided settings that ranged as being appropriate for personal reflection and study to a more communal interactive learning environment. “Tethered” technology stations are integrated into built in casework around columns, allowing instructors and students to interact on a personal setting. With an extensive technology upgrade, more informal café and lounge type conditions are offered as well. The project opens the student commons to the street, addressing the community and activating the urban corridor. Housed to accommodate programs as disparate as a new student commons, Student services, counseling, student accounts, as well as the ancillary support spaces, the scheme rectifies the degrees of required privacy with the mandate of an open and approachable environment.